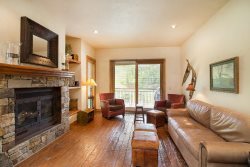 Ballard Unit 204 North - 3 Bedrooms - 2 Bathrooms - Sleeps 8 - Deluxe Condo - Central downtown Telluride location, Ballard is just 1.5 blocks from Telluride Town Park, the Gondola, Lift 8 and Main Street. Perfect for families, couples, festival goers and skiers. Extremely helpful and friendly staff. They are truly genuine people! I will contact Latitude 38 for future bookings. The Latitude 38 vacation rental website and VRBO had contradictory information on number of required nights, that was a little confusing for our stay, but it all worked out extremely well in the end. Lovely condo that was perfect for our traveling family stay. We have rented many properties in Mountain Village and Telluride over the past 15 - 16 years both in summer and winter and found Latitude 38 wonderful to work with. The unit we rented was better than the pictures depicted and we look forward to returning in the near future. We will definitely look at Latitude 38's properties first. We always enjoy staying at the Ballard House! The condo was perfect for us! It is well maintained and very comfortable. The location is great too! Levi is wonderful to work with! Staff and Condo were excellent! Loved the location and the town of Telluride is spectacular!